KENNEDY SPACE CENTER, Fla. -- Two months after a sister ship successfully concluded a demo flight, the U.S. military's second robotic X-37B space plane is in Florida preparing for blastoff March 4 on another secret mission, according to an Air Force official. 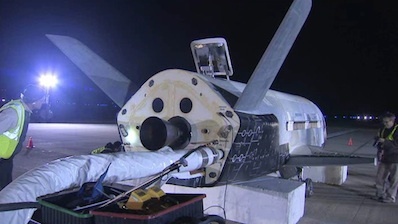 The 29-foot-long, 14-foot-wide space plane is being readied for flight in a processing facility near its launch site at Cape Canaveral, Fla., according to Lt. Col. Troy Giese, the X-37B program manager in the Air Force Rapid Capabilities Office. Like its predecessor last year, the X-37B will lift off inside the nose cone of an Atlas 5 rocket. The flight is scheduled for March 4, but the Air Force has not released a time for the blastoff. Responding to written questions, Giese said the reusable spacecraft -- also called the Orbital Test Vehicle -- is undergoing final functional tests before attachment to the Atlas 5 launcher in late February. The winged vehicle arrived in Florida in early January, according to Giese. The United Launch Alliance Atlas 5 rocket is being readied for launch at Cape Canaveral's Complex 41. Both stages of the booster have been assembled inside a vertical integration building, and the rocket is scheduled to roll out to the pad later this week for a pre-launch practice countdown and tanking test. The wet dress rehearsal is on tap for Friday, according to an Air Force spokesperson. 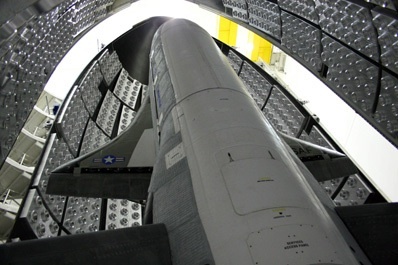 Boeing Phantom Works built two space-ready X-37B space planes at a facility in Southern California. The first OTV mission launched in April 2010 and returned to Earth Dec. 3, successfully touching down on autopilot on a 15,000-foot-long runway at Vandenberg Air Force Base, Calif. The nearly 225-day flight was almost flawless, according to the Air Force. The only anomaly disclosed so far is a blown tire during landing. Workers reduced the second OTV's main landing gear tire pressure by about 15 percent to accommodate imperfections in the Vandenberg runway engineers believe led to the blowout in December. Officials carefully analyzed data and inspected the ship to see if any other improvements were needed for the second vehicle. So far, Giese says, no major changes are expected before the March 4 launch. "The Air Force remains extremely pleased with the performance of OTV 1," Giese said. "The quick-look review of OTV 1 re-entry and landing data and exterior inspection revealed no significant changes required for OTV 2. The Air Force will perform a detailed inspection and analysis as part of the refurbishment of OTV 1." Although Pentagon officials openly discuss the X-37 program and the spacecraft's unique capabilities, the Air Force says its mission objectives and cost are classified. Photo of the X-37 space plane on the runway after landing at Vandenberg Air Force Base. Credit: Boeing Co.
"We want to be able to put an object up into space, materials, technology and so forth, test them out, bring them back and examine them," said Richard McKinney, deputy under secretary of the Air Force for space programs. "In that respect, this is a test vehicle." McKinney spoke with reporters after the first X-37B landing in December. "It's a huge capability to allow us to do this, to test out materials and other objects in space and bring them back and take a look at them," McKinney said in December. "Normally the objects either stay up there, they turn into space debris, or they burn upon reentry. So this allows us to check something out and bring it back." Air Force officials would not discuss experiments aboard last year's flight or the upcoming mission, but McKinney said the X-37B is designed to demonstrate new technologies that could be employed on future satellites. The Air Force hasn't had such a capability since it backed out of the space shuttle program in the 1990s. Although the shuttle carried much more Air Force cargo to orbit, it didn't have the 270-day endurance of the X-37B. "The ability to reuse technologies and the ability to operate experiments in space and return them to Earth for examination is a capability that's been severely limited in the past for us to do," McKinney said. "And we certainly have not had any long-duration-type ability to return experiments to Earth." Managed directly from the Pentagon, X-37B applications might include materials science, space surveillance, imaging and reconnaissance, communications, navigation and weather research. "We're in a very serious and important business in providing national security space capabilities for our nation," McKinney said. "As you well know, some of those technologies are state of the art, highly complex, very technical, and our ability to examine those technologies before they're made operational is a long-sought-after capability. Now we can test those capabilities well in advance of making them operational." Giese said he anticipates a third X-37 flight some time in the future, but the Air Force has not decided when it would launch. The X-37 craft that just returned to Earth in December would be assigned to fly a third OTV mission, according to Giese. "The refurbishment of that vehicle will play a major part of that decision," Giese said.